As you approach Hotel Jardín Tropical, the Adeje Coast in the south of Tenerife Island becomes an orchard, a paradise of light and greenery where you can enjoy all the benefits of the Canary Islands, such as its average annual temperature of 23 ºC. Hotel Jardín Tropical has 390 recently refurbished rooms and suites designed to offer maximum comfort to our guests. Both the Comfort Rooms, decorated in a modern and elegant style, and our exclusive Suites provide an elegant and comfortable atmosphere. All rooms open out onto the sea or our luscious gardens and natural spaces so you can enjoy Tenerife’s spectacular light, the warmth of its sunrays and the Atlantic breeze. Average area of 32 m2. Homely rooms decorated with warm colours, a king size bed and a balcony decorated with teak. Mellowness, taste and comfort in every corner. Average area of 42 m². King size bed available (on request and subject to availability). Elegant rooms with a separate lounge and exclusive services including a pillow menu and an aromatherapy set. Enjoying their spectacular views is true luxury for the senses. Area ranging between 50 and 55 m2. Tea and coffee facilities. Mini bar. Satellite TV (including CNN and Canal Golf, among others). Savour the exquisite and varied cuisine of each restaurant in Hotel Jardín Tropical while you enjoy magnificent views of La Gomera and the Atlantic Ocean. Gourmet restaurant specialising in fresh fish and seafood combined with traditional elements of Canary Island cuisine. Gourmets can enjoy wonderful views of the Atlantic Ocean from its cliff-top location. 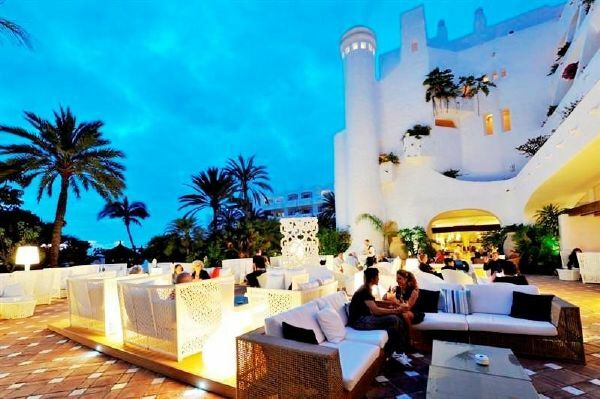 Its gourmet cuisine attracts tourists from all over Tenerife. This à-la-carte restaurant serves lunch and dinner. In this new phase, The Patio becomes a restaurant whose main feature is meat of the finest quality accompanied by a cellar of 100 wines, live music in the enchanting Andalusian patio from which the restaurant gets its name and exquisite service. We await your visit. "Las Mimosas", the hotel's gastronomic heart, pampers its guests every morning with a generous breakfast in a light atmosphere. Whether we are talking about dishes prepared before clients' very eyes or about fine fruit and sweets, guests can choose from a great variety of food. This buffet-style restaurant is open for breakfast and dinner. A very cosy, warm and distinguished atmosphere, this original restaurant serves an à la carte menu that changes every day and includes fresh vegetables, quality meat and fish dishes, as well as an excellent red, white and rosé wine list. The restaurant’s confectionery is truly exceptional. Offering a wide selection of snacks and lunch dishes in a very relaxed atmosphere. Staying at Hotel Jardín Tropical is not only a pleasure for the mind: it is also renewal for the body. Relax with a swimming pool massage surrounded by tropical plants, shape up in the fitness area, receive next generation treatments such as lymphatic drainage, reflexology and hot stone massage (among others), or treat yourself to a Turkish bath or algae bath. Hotel Jardín Tropical's Wellness Centre will restore the energy lost by your body during the year. Jacuzzi: Stimulating jets of water and bubbles in a mini hydromassage pool. Sauna: Penetrating heat that helps detoxify the body and cleanse the skin. Turkish Bath: Pleasurable and healthy steam baths at relatively low temperatures. Showers: Refreshing tropical rain showers for a unique sensation. Our facial treatments are based on the benefits provided by marine algae which are rich in amino acids, vitamins and trace elements. The algae and sea mud body wraps revitalise the body and flush out toxins, helping eliminate water retention. If you are passionate about Golf, at Hotel Jardín Tropical you will find what you have been looking for: our Dedicated Golf Department will make all your bookings at the Island's golf courses (Golf Costa Adeje, Amarilla Golf, Golf del Sur, Golf Las Américas, Golf los Palos, Real Club de Golf, Buenavista Golf and Tecina Golf-La Gomera). In addition, you will also be entitled to preferential access to Abama Golf Course, a professional 18-hole golf course designed by Dave Thomas. 2003, 2004, 2005 and 2006. The “Reise-Oscar” Award from the Austrian Tourist Board. 1998, 1999, 2001, 2002 and 2003. Tui Holly’s 100 best hotels in the world. 1995, 1996, 1997,1998, 1999, 2001, 2002, 2003. Tui Holly’s 6th best hotel in the world. Please note that for technical reasons of force majeure, the Hotel Jardín Tropical is forced to make work in the main pool which upon completion will mean a considerable improvement in performance. The Hotel Jardín Tropical regrets the inconvenience caused to customers during the time of execution of the works, customers can enjoy the pool "The Rocks" with sunbeds and parasols completely free of charge.